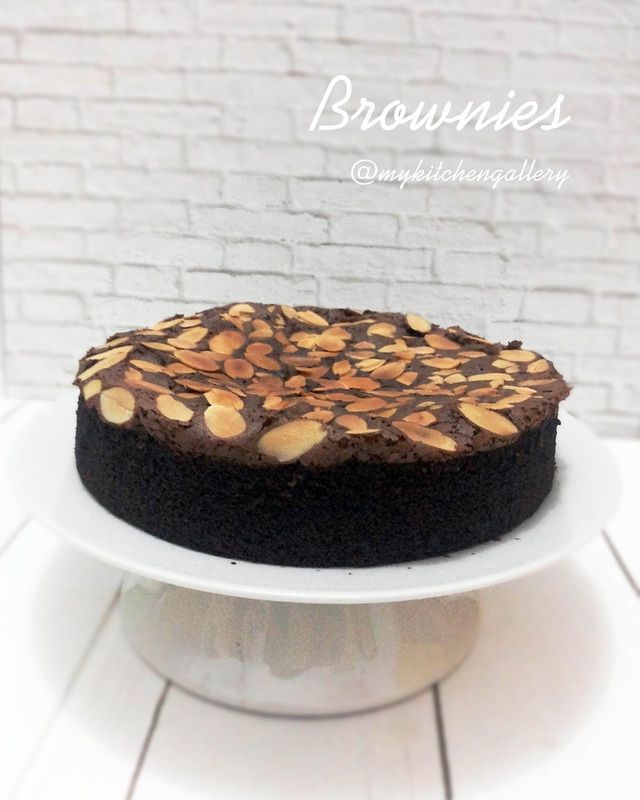 This recipe is really suit for me who is not chocolate lover but still want to enjoy brownies. i don't like very chocolaty and fudge brownies. I like the brownies without thick chocolate taste and more cakey / spongy texture. So when i found this recipe from christine recipe, i thought this brownies is definitely suit me and the one which i look for a long time. 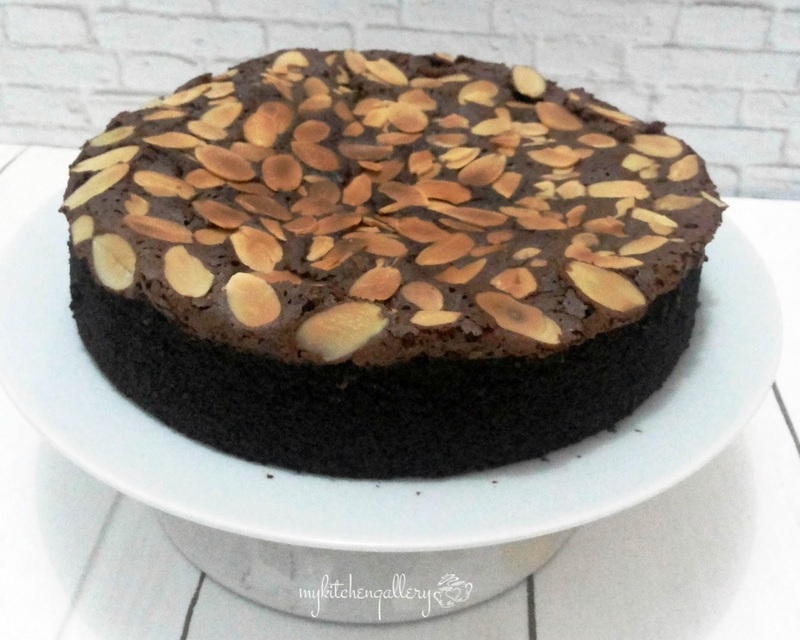 I spread some almond on the top, it turns up pretty good and give the crunchy feel. The amount of chocolate in this brownies still a lot so you still can taste the chocolate taste but because the cakey texture make the chocolate taste more acceptable for person like me who don't eat much chocolate. Preheat oven to 170degC. Line a 18 cm round baking tin with baking paper and grease the sides. Place chocolate and butter in a large, clean mixing bowl over simmering water. Make sure the bottom of the bowl doesn’t touch the water. Stir the chocolate and butter occasionally until completely melted. Remove from heat. Use an electric mixer to beat the eggs, sugar and vanilla extract until pale and fluffy, about 2 to 3 minutes. Use a balloon whisk to mix in the chocolate mixture. Sift in flour, baking powder. Make sure not to over mix. Just to combine all the ingredients. Pour the batter into the lined baking tin. 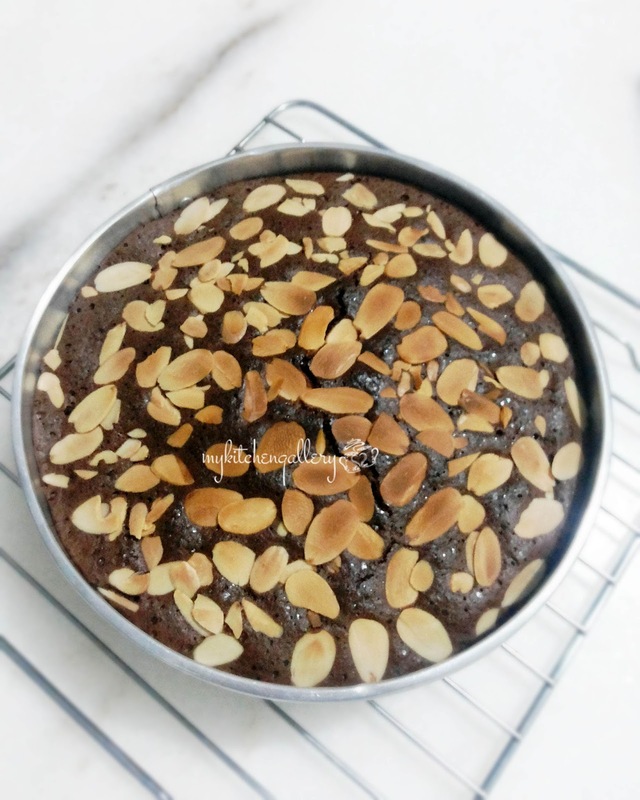 Level the surface with a spoon and spread some almond sliced.Bake in the preheated oven for about 25 to 30 minutes. It’s cooked through if an inserted skewer or needle comes out clean. Let it cool on a wire rack. 1. Panaskan oven terlebih dahulu di suhu 180 degC. 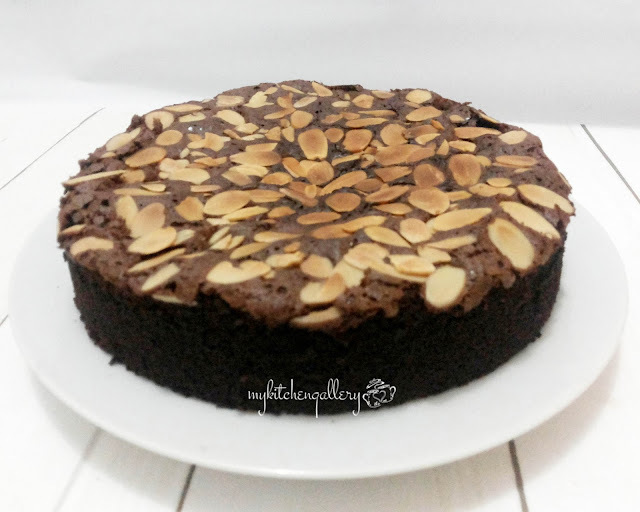 Alasi loyang bulat 18cm dengan kertas baking kemudian olesi dengan margarin. 2. Lelehkan coklat dan mentega di dalam panci dan letakkan di atas air panas.